Part II Were Blackwater Security contractors the fall guys? Home » Part II Were Blackwater Security contractors the fall guys? In December 2008, the U.S. charged five of the Blackwater contractors with 14 counts of manslaughter, 20 counts of attempted manslaughter and a weapons violation. (34 victims in total). On December 31, 2009, a U.S. District Court judge dismissed all charges on the grounds that the case against the Blackwater guards had been improperly built on testimony given in exchange for immunity. But he did not dismiss it “with prejudice” which simply would have meant that the charges could not be refiled at a later date. It was that decision which created the scenario now faced by the Blackwater contractors. The politics of favoring the Iraqis began when Prime Minister Nouri al-Maliki criticized the dismissal. In April 2011, a US federal appeals court reinstated the manslaughter charges against Paul A. Slough, Evan S. Liberty, Dustin L. Heard and Donald W. Ball after closed-door testimony. The court said “We find that the district court’s findings depend on an erroneous view of the law.” The prosecutors had dismissed Nick Slatten prior to the appeal, and the appellate court honored that dismissal. Interestingly, by the trial in 2014, defendant Donald Ball’s charges were dismissed, and though the government referred to him as a “shooter,” he was not called as a witness. Why? By then prosecutors had also manipulated the law to return Nick Slatten to the indictment. 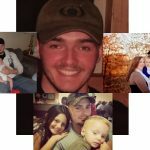 On October 22, 2014, a Federal District Court jury convicted Nick Slatten of first-degree murder, and the three other contractors (Slough, Liberty and Heard) guilty of voluntary manslaughter and using a ‘machine gun’ to commit a violent crime. But there are issues of major magnitude with those charges and the “evidence” used to support the prosecution of them. The Blackwater operatives have never said there weren’t a lot of rounds fired that day. And it is an unfortunate fact that sometimes innocent people get caught in the crossfire. It is the extent of that “collateral damage” that is suspect. And the fact that someone was shooting at the Blackwater operatives was real…but the narrative was changed by the government. Nick Slatten was originally dropped from the case. After failing to coerce Slatten into giving up his constitutional right to being time-barred from the prosecution, the DOJ charged him with murder – in spite of the fact the government admitted they had NO EVIDENCE against him. Not one- let me repeat, NOT ONE witness, either Iraqi or American, stated they saw Mr. Slatten shoot the driver of the white Kia. Quite the opposite, Jeremy Ridgeway and several others stated they shot the driver. How can that be? These three men were convicted of Manslaughter, Attempted Manslaughter, and Using and Discharging a Firearm. The Firearm charge was under the same code as Jose Compean and Ignacio Ramos, the Border Patrol agents whose sentence was eventually commuted by President Bush. Witnesses stated that 2nd victim in the white Kia was specifically shot by Jeremy Ridgeway, a fact that he also admitted rather graphically. Again, the man who received the plea deal was the confessed killer of both people in the white Kia. Jeremy Ridgeway suffers from PTSD. He pled guilty to voluntary manslaughter and attempted manslaughter in exchange for his testimony against the others. Unfortunately, his story changed often, and was highly suspect throughout his time on the witness stand. Even though the defense brought that to light on numerous occasions, it was ignored both by the prosecution and the jury. He did lay down erratic, suppressive fire toward the south, and aimed west and north during the engagement in Nisur Square. Some of the counts he attributed to others, were laid squarely on his shoulders in testimony. This is but one of the “out of control” men that the government and the media want you to believe massacred 14 and injured 18 people. MEJA (Military Extraterritorial Jurisdiction Act) was the jurisdictional law used to charge the Blackwater operatives. Read that, the MILITARY Extraterritorial Jurisdiction Act. The law was created SPECIFICALLY for Department of Defense operatives. Blackwater operatives were hired by the US STATE DEPARTMENT, not the DOD. In order to charge them under MEJA, it would mean that the DOJ had to expand the law on their own to cover State Department contractors without Congressional approval or oversight. This is an egregious misconduct on the part of the DOJ and courts- and it’s not the only one. United States Code 924-c is the statute under which the Blackwater team was charged. That code was designed for gangs – not government contractors actually issued their weapons by the Government. The code is: “Carrying, using, or possessing a firearm in connection with crime of violence or drug trafficking crime” – it carries up to a 30 year mandatory sentence. The code was never designed for defenders, issued guns by the US government – it was designed for gang firearms violations with illegal weapons. The State Department conducted an investigation within three days of the incident, and determined that Raven 23 had taken enemy fire, which validated their firing in self defense. That should have been the end of it. 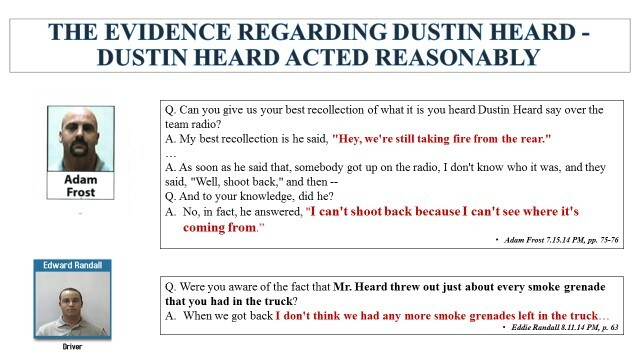 But because of pressure from the Iraqis, the US sent the FBI three weeks later…both after there was no evidence left at the scene, and after there was time to coach the witnesses. Nine certified deaths and nine hospital records were turned over to FBI Special Agent Carolyn Murphy by the Iraqi Ministry of the Interior in 2008. At the time of 2008 indictment, the total killed/injured grew to 34. But by the time of the trial in 2014, 14 people were listed as deceased and 18 people listed as injured. The numbers shifted. Why? Some of the death certificates had been revised and some predated the Nisur Square incident. 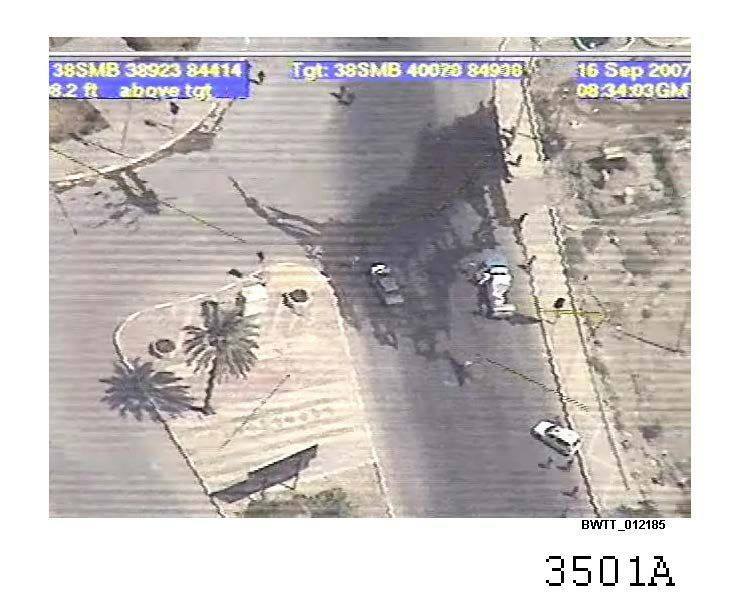 The final trial list included 32 victims in total either killed or injured in the “massacre.” Look at the photo below: the white Kia is on fire in the center of the photo. Two people were inside that vehicle and both were killed. There was a red Hyundai and a white Opel that also reportedly had casualties, vehicles that were outside the traffic circle. Again, Jeremy Ridgeway was shown to have fired indiscriminately toward those vehicles. Make no mistake, there WERE casualties in Nisur Square on September 16, 2007. But how many is open to question.